The historic city of Plymouth lies some 192 miles (310 km) south-west of London between the estuaries of the Rivers Plym and Tamar. The port was born as a trading post for the Roman Empire and grew down the centuries until, today, Plymouth is the largest city in the South West of England. The city faces Plymouth Sound, a safe anchorage protected by a mile long breakwater. The Royal Naval Dockyard at Devonport is said to be the largest operational naval base in Western Europe. The city's long and distinguished nautical history is bound up with the achievements of some of Britain's most famous seamen such as Hawkins, Raleigh and Sir Francis Drake. In 1620 the Pilgrim Fathers sailed from Plymouth on their epic journey to the New World where they established Plymouth Colony and helped found the United States of America. During World War II, Plymouth's naval importance attracted the attentions of the Luftwaffe and the city centre was partially destroyed. Today the centre has been completely rebuilt and provides a vibrant shopping experience. The city has an ice-rink and all the theatres, parks, museums and leisure centres you would expect to find in a large conurbation. Plymouth Hoe, a large public open space on the seafront, provides commanding views of Plymouth Sound and Drake's Island. The Hoe is a popular place to view the varied nautical activities offshore. Here can be found the statue of Sir Francis Drake who is reputed to have been playing bowls on the Hoe when he received the news that the Spanish Armada was approaching up the English Channel. 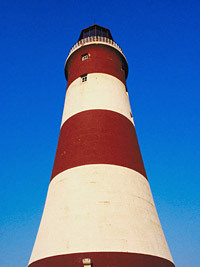 A prominent sight on the Hoe is Smeaton's Tower, which is the upper part of a lighthouse that once stood on Eddystone Rocks some 22 km out to sea. The British Firework Championships attract tens of thousands of spectators annually to the Hoe. The Barbican is the real heart of old Plymouth, which has been preserved complete with narrow cobbled streets, quayside pubs and restaurants. Here you will find Plymouth's old Gin Distillery with its welcoming visitor centre. The Barbican Mayflower Centre tells the story of many of the adventurers who sailed from these old quays including Sir Francis Drake who set sail in the Golden Hind to encircle the globe and the Pilgrim Fathers who voyaged to a New World across the Atlantic. The famous 'Mayflower Steps' can be found near the Barbican, close to the point from where the Pilgrims set sail in the Mayflower in 1620. A commemorative portico and memorial stone record the historic event. At Thanksgiving, many Americans come to this memorable spot to celebrate. Another monument of interest is the Royal Albert Bridge, which spans the River Tamar estuary and carries the rail network across the river into Cornwall. It was designed by the Victoria engineer Isambard Kingdom Brunel and opened in 1859. A fine view of Devonport and its naval ships can be enjoyed as the train creeps slowly across the estuary. A more recent road bridge has been built alongside to carry the A374 across to Saltash and down into Cornwall. The gallery contains excellent examples of West Country Art. Stanhope Forbes "Fish Sale on a Cornish Beach" is a notable exhibit from the Newlyn School. Also on display is the Cottonian Collection of sculpture, drawings and books. The museum has archaeology, local and natural history exhibits, plus silver and local China. Includes many 'hands-on' exhibits for children. A restored 16th-c Elizabethan Merchant's house containing exhibits depicting much of the history of Plymouth, including information on Sir Francis Drake and the history of the Eddystone Lighthouses. 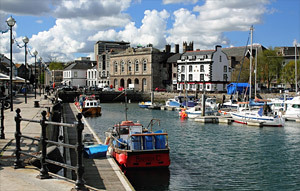 Located on Plymouth's historic Barbican. Once lived in by an Elizabethan merchant or mariner. Contains original 16th-c furnishings. Britain's largest and deepest aquarium centre with over 50 tanks housing thousands of fish. The Royal Citadel is a spectacular 17th-c stone-built fortress at the eastern end of the Hoe, designed to defend the coastline from the Dutch and reputedly also to intimidate the citizens of Plymouth. It is still used by the military but is open for scheduled public tours.